Prayer is a time we can choose to come before God however we are, whenever we want, and whatever we need. In these cases, we’re sort of “in control” of the interaction. There are also times when God commands/invites us to come before Him on His terms. Those times when God “hosts” us are His weekly Sabbath and the yearly holy days. Though I’ve been keeping the holy days outlined in Leviticus 23 my whole life, I hadn’t thought about them quite like this before. My family and I kept the Feast of Tabernacles (Sukkot) with a group in West Virginia this year, and one of the Bible studies there was called “Keeping A Holy Convocation.” It’s one of the best, most thought-provoking messages I’ve ever heard and it’s what prompted today’s post (click here to listen to that Bible study). 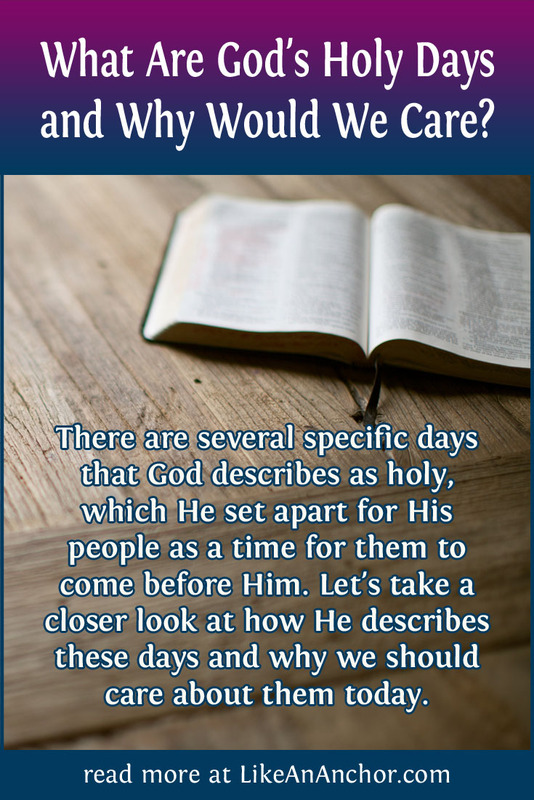 I won’t take the time here to address the question of whether or not modern believers should keep these holy days, but you can check out my posts “Top 5 Reasons for Christians to Keep God’s Holy Days” and “Rhythms of Worship” if you’re curious. One reason these days are important to us is that they teach us about God’s plan and His priorities, including who we’re meant to be in Him. They’re part of our identity as God-followers, which makes them a key part of our faith and it also relates to this blog’s theme of finding our true selves in God. This is probably going to be the first post in a series, since there is so much to explore in this topic and I don’t want today’s post to become unreadably long. So for now, let’s just take a look at the ways God describes His holy days. There are 5 key Hebrew words that give us a picture of what these days are and why we should care about them. Mo’ed is used of the time for a baby to be born, the right season to keep a commanded Feast day, and for the place of a gathering and/or the people gathered. The Rabbi at my Messianic congregation defines mo’ed as the right person/people, in the right place, at the right time, for the right reason. The root word of mo’ed is ya’ad (H3259), which means to appoint, assemble, meet, or betroth. The betrothal translation isn’t used much, but I find it interesting given how much the analogy of Christ as our bridegroom is tied-in with the holy days. Miqra (H4744) is considered a synonym for mo’ed and it’s used 23 times in the Bible. It refers to a rehearsal, assembly, or convocation (which means to call together, as for a meeting). God’s feast days are called “holy convocations,” marking them as meeting times set apart for His purposes. Miqra can also mean reading aloud. Its root word qara (H7121) means to call, cry out, recite, or enunciate a specific message. In some cases, it means calling by or calling on a name. The use of miqra to mean readings or callings is often connected to the Feasts. Here in Nehemiah, the people had just rediscovered the fall holy days and were devastated to learn how much they’d lost. As the story continues, we see them overjoyed at the chance to keep the Feast of Tabernacles (Neh. 8:11-18). The previous two words apply to all the holy days of God. This one, chag (H2282), is used more specifically. It means festival or feast, and refers to the three pilgrim feasts of God: Unleavened Bread, Pentecost, and Tabernacles. Chag appears 62 times in the Old Testament. These holy festival seasons are described with a different word than the other holy days, and there are some differences in how they’re kept. For example, individuals are told to bring offerings during these days, but not on the other holy days. We’re also told to “keep” these days, which is the word chagag (H2287). Chagag is the root word of chag, and it means to hold or keep a feast. It can also be translated “dance” or “reel,” which connects to other instructions to rejoice in these days. Shabbat and the closely related word shabbaton (H7676 & H7677) refer to a Sabbath observance. These words show up 122 times in the Old Testament. They are used of the weekly Sabbath and of the fall holy days (Lev. 23:24, 32, 39). The root word is shabbath (H7673), which means to cease, desist, or rest, and that’s something we do on all the holy days. 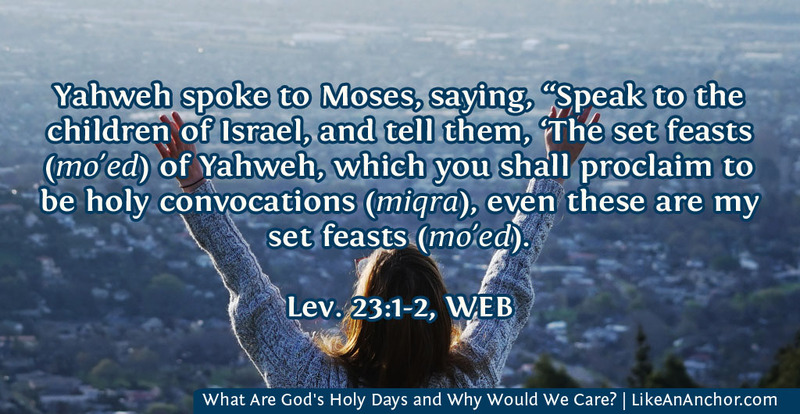 Though shabbat is not used of the spring holy days or Pentecost, instructions about these days still include the command to not work, so we tend to describe them as Sabbaths as well. This last word only shows up 11 times in the whole Bible. Atsarah (H6116) means an assembly or sacred/solemn meeting of a company or group. The atsarah that belonged to God are among the things that Israel profaned. In a positive sense, atsarah is only used specifically of the Last Day of Unleavened Bread (Deut. 16:8) and the 8th day concluding the Feast of Tabernacles (Lev. 23:36). Its root word, atsar (H6113), means to restrain, retain, withhold, close up, or refrain. Apparently, these are two most solemn holy days that God commands. I’ve heard it said that we should listen closely even when God says something once, but when He says something two or more times then we know it’s something to pay extra attention to. Not only does He talk about these holy days more than once, He uses five different words to explain over and over again how special they are.